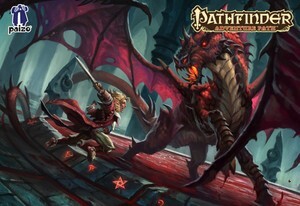 The "A song of silver" SoundPack gives you the complete audio solution when playing the forth chapter of Pathfinder's "Hell's Rebels" Adventure Path. All the preparation is done for you, and every sound you'll need is right at your fingertips. Too long has the diabolic Lord-Mayor Barzillai Thrune inflicted cruelties and increasingly oppressive laws on his citizens. The heroes of the beleaguered city of Kintargo finally strike back at the sources of corruption, as their rebellion mobilizes in the streets. Rescuing old heroes from forgotten prison cells, reclaiming control of key locations, and performing an ancient song that was used years ago to protect the city from Hell's agents are but the preamble for the decisive battle—an assault on the enormous Temple of Asmodeus! * and... much much more! Pathfinder Adventure Path: Hell's Rebels, A song of Silve © 2015. Paizo Inc., the Paizo golem logo, Pathfinder, and Pathfinder Adventure Path are trademarks of Paizo Inc. Author: James Jacobs. SoundSet © 2015. Sounds created under license with Paizo Inc.